Simon has been a school teacher, educational psychologist and university academic. He is concerned that education as a social and socialising process is under threat in many countries. 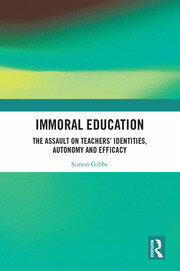 His latest work 'Immoral Education: The assault on teachers' identities, autonomy and efficacy' is his response to that concern and his concerns for teachers' well being. Simon has been working in education for over 40 years. First as a school teacher then, having retrained as a psychologist, as an Educational Psychologist. Latterly he has been an academic with involvement in training Educational Psychologists. He studied for his PhD (researching the development of phonological awareness and word reading) under David Wood at Nottingham University and was later involved (with Maggie Snowling and Charles Hulme) in large scale reading interventions in schools. More recently he has been investigating influences on teachers' efficacy beliefs and how these beliefs may be compromised. He is particularly concerned by the attrition of teachers and the dehumanising of education. Central to this is his work to develop understanding of educational systems (as currently operationalized in England and other countries) perpetuates discrimination and the 'essentialising' of difference. Work in hand includes an international study of the effects on teachers' beliefs of labels ascribed to children. In 2017 he was honoured to receive the British Psychological Society Division of Educational and Child Psychology's Award for his Distinguished contribution to Educational and Child Psychology. Walking and climbing; The music and poetry of JS Bach and Bob Dylan.